Blurb Description: #1 New York Times bestselling author Kresley Cole introduces The Arcana Chronicles, post-apocalyptic tales filled with riveting action, the dark mysticism of Tarot cards, and breathtaking romance. She could save the world-or destroy it.Sixteen year old Evangeline "Evie" Greene leads a charmed life, until she begins experiencing horrifying hallucinations. When an apocalyptic event decimates her Louisiana hometown, Evie realizes her hallucinations were actually visions of the future-and they're still happening. Fighting for her life and desperate for answers, she must turn to her wrong-side-of-the-bayou classmate: Jack Derveaux. But she can't do either alone.With his mile-long rap sheet, wicked grin, and bad attitude, Jack is like no boy Evie has ever known. Even though he once scorned her and everything she represented, he agrees to protect Evie on her quest. She knows she can't totally depend on Jack. If he ever cast that wicked grin her way, could she possibly resist him? I’ve taken a couple of days to sit down, pause, process and then write this review. 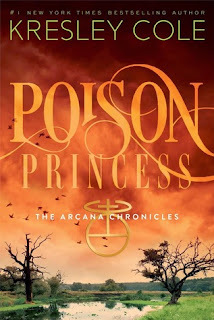 Poison Princess, the first book in the Arcana Chronicles, BLEW MY MIND. It was brutal, swoon-worthy, filled with questions that made me go slightly insane, an amazing plot and had the best line-up of characters ever. 1. EVERYTHING COMPLICATED // THE AMAZING PLOT: This plot line was GORGEOUS, okay? I don’t usually read post-apocalyptic dystopian novels, but Poison Princess was just BEAUTIFUL. I loved the sheer detail of the plot line, setting it up for the next few books and answering a few questions while leaving SO MANY left for book two. 2. Jackson Derveaux: I CANNOT RESIST THE BAD BOYS, OKAY? Especially ones that are secretly soft on the inside but on the outside are gruff and non-caring and I LOVED HIM, OKAY? Through the book, he stayed who he was but he changed and totally won my heart! He was EVERYTHING. 3. The Tarot Cards: I THINK THIS WAS A BEAUTIFUL IDEA, OKAY? I’ve never really been into Tarot Cards, and the most I’ve seen of them is in the Just My Luck movie, BUT THIS HAS ME SO INTERESTED OMFG. 5. The Parent Factor: Know how the parents are mysteriously ALWAYS gone in these novels, conveniently killed off before you get to know them? Well, for about half of this book, IT WAS NOT THE CASE! I loved that Evie and her mum stuck together, and after her mother was always a source of inspiration for her. 6. The Other Tarot Cards: Since everyone in the book – or rather the game - signifies a tarot card, the characters that Evie meets along the way – Matthew (The Fool), Selena (The Moon), Finneas (The Magician) – were all AMAZING and equally frustrating and I can’t wait to read more with them! ALL IN ALL, A book you should DEFINITELY read for its brilliant characters and brutal plot lines! 5 stars! Any Post-Apocalyptic Novels I should be reading? Have you read this series? What did you think of it? I can't WAIT to talk to all of you lovely bookdragons!